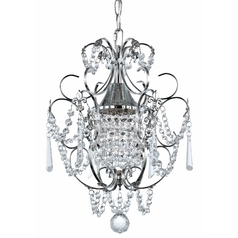 The following are detailed specifications about the Crystal Mini-Chandelier Pendant Light in Chrome Finish. 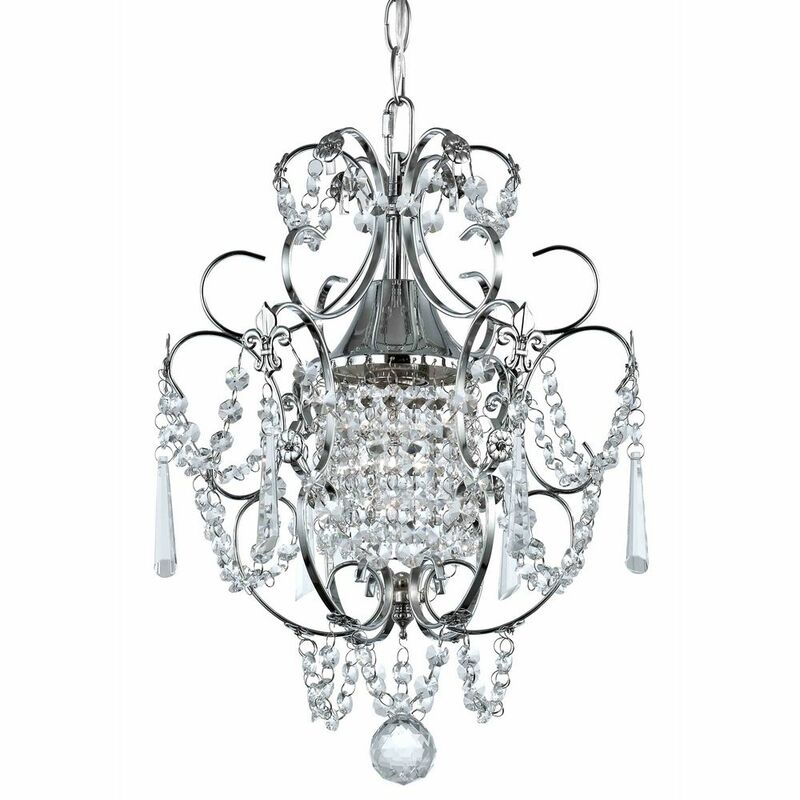 Bring elegant sparkle and shine to your space with this crystal chrome mini-chandelier light from Ashford Classics Lighting. This Chambery collection light features chrome hardware that perfectly complements the crystal accents for a piece that's just as home in your study as in your formal dining room. 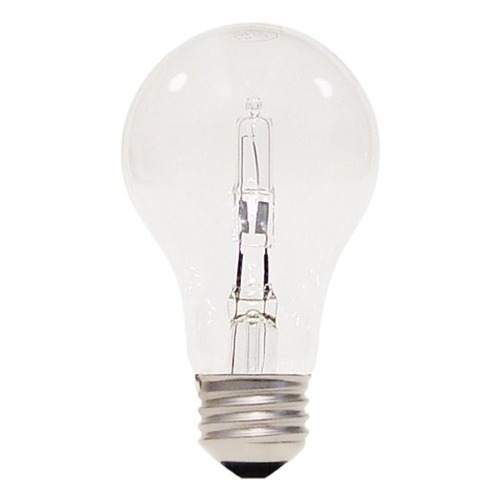 Mount this light in your bedroom to add glitz and glamour as well as softly diffused illumination. 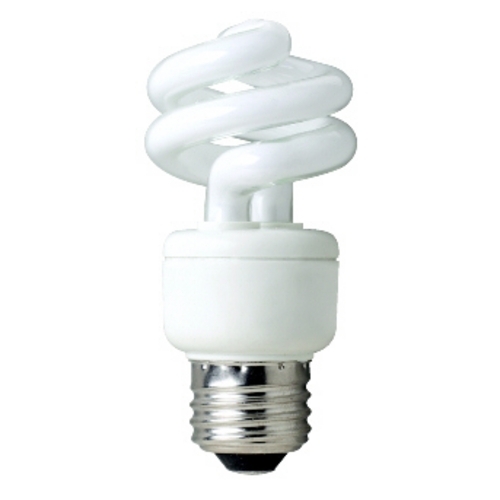 This fashionable yet functional mini-chandelier light requires one medium-base incandescent light bulb of no more than 60-watts. I am Extremely pleased with my mini Chandelier.. It is beautiful.. When i unboxed it and saw how beautiful it actually was i couldn't believe the very affordable price..I am so surprised by how much light it reflected all in the Entryway.. 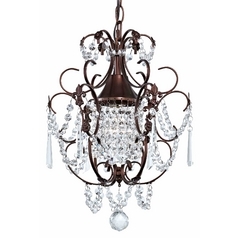 I am ordering more lights from your company, these crystals are real Chrystal's not plastic like most home improvement stores have..this light looks like a Big ticket item, all of my friends have bragged on Facebook about my pics of it..
bought this for a small vaulted ceiling vestibule that i added to front of my house. sooo cute and perfect size an at a great price! I was more than happy with the speed of shipping and delivery from this company. And even better, this chandelier is simply stunning. I ordered it for over our tub area in the master bath and it is perfect. I was a little worried about stringing the crystals after reading reviews elsewhere, but the instructions it came with were clear and the process only took about 15 minutes. It looks like a million bucks for a tiny fraction of the price! I highly recommend! This Crystal Mini-Chandelier Pendant Light in Chrome Finish is part of the Chambery Collection from Ashford Classics Lighting. The following items are also part of the Chambery Collection.